Valentine’s Day isn’t just for couples going out and celebrating their love for each other, but it’s also for kids. Valentine’s Day is a day where kids can give each other cards, candy, and most importantly make crafts! These crafts are not like the normal, everyday crafts, but are crafts covered in hearts and made with love! For this craft you will need paper, tape, something to color with, scissors, and an optional: light cardboard like card stock or empty cereal boxes. Two templates are available that provide a smaller size and a slightly larger size. This is a cute, colorful, paper craft that is fun to wear on Valentine’s Day. Visit DLTK for the templates and exactly how to put these adorable paper glasses together. Tied pillows kits are the classic craft for kids, and what’s better than one themed for Valentine’s Day? The best part about this kit is after you’re done creating it, you can snuggle up with it afterwards. The Fleece Valentine Heart Tied Pillow Craft Kit comes unfinished and for individual use. This is something that can be done as a group, that kids will absolutely enjoy! I love cute crafts like these! Be mine or “bee” mine? 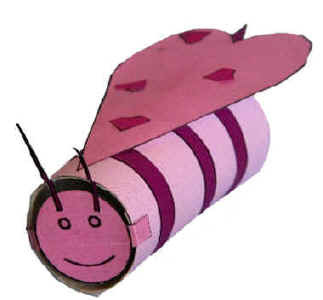 For this craft, you will need a toilet paper roll or cardboard tube, a printer, paper, scissors, glue, and something to color with. DLTK provides thorough instructions and templates. 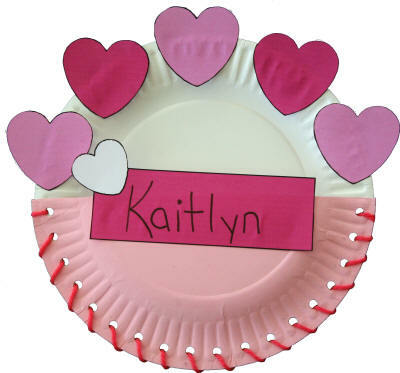 This is cute for any age that is looking to create a cute, adorable craft like this–perfect for Valentine’s Day! DLTK provides multiple ways that children can hold all of their cute, Valentine’s Day cards they get at school. Depending on how exotic you would like to get, there are multiple ways you can make different card holders. In my eyes, options are always better! Just make sure that you are ready to color and to have fun with this craft! What’s better than a craft that is also a treat? All that you need to do is pick some of your favorite candy and put it on a stick! Candy Kabobs are fun, and is something that doesn’t just have to be for Valentine’s Day. What a wonderful treat to create, that you can share with your closest friends and family, even for your classmates!